Jufrie Mahmood Makes Baseless Claims – Sinking It In! SDP member Jufrie Mahmood has once again made accusations without evidence to back up his claims. 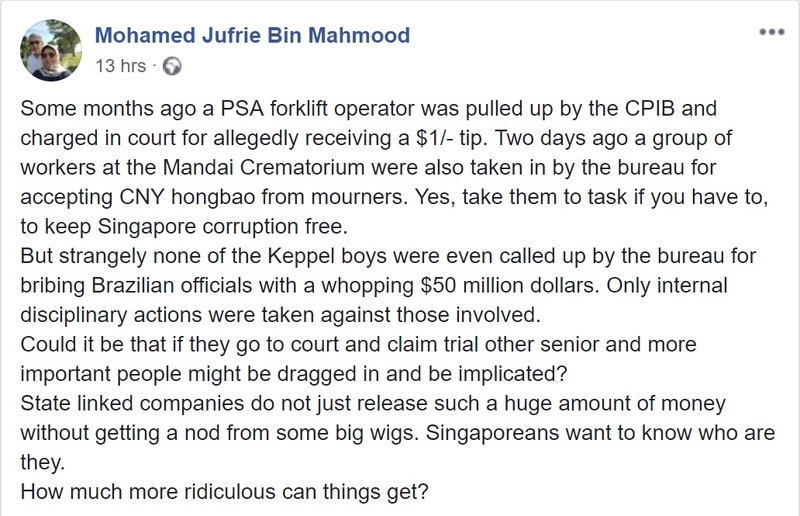 In a Facebook posting on 8 February, Jufrie lamented that PSA forklift operators and Mandai Crematorium caretakers were called up by the Corrupt Practices Investigation Bureau (CPIB) for receiving a $1 tip and CNY angbaos respectively. He then went on to say that “strangely none of the Keppel boys were even called up by the bureau for bribing Brazilian officials with a whopping $50 million dollars.” He also took the opportunity to cast aspersions on the Government, saying that “State linked companies do not just release such a huge amount of money without getting a nod from some big wigs”, suggesting that the Government condoned the actions of Keppel. He ended his post by mocking the “ridiculous” state of things in the Government. Perhaps Jufrie should get his facts checked before making these baseless claims. In a Straits Times article dated 2 February 2018, it was reported that those involved were arrested by the authorities. They included Mr Tay Kim Hock, former president and chief executive of Keppel Fels Brasil, a wholly owned unit of Keppel Offshore and Marine (the entity involved in the bribe; a unit of Keppel Corporation). For their involvement, he and five others were arrested by the CPIB. If Jufrie’s intention is to suggest some kind of cover up by the Government, then he should probably show some evidence of what he claims to be true.